The emotional and psychological well-being of individuals promotes healthy development, functioning and increases the capacity of individuals to live productive lives while striving towards reaching their full potential. A major aspect of the school environment includes promoting the mental health of all students, and the provision of programs and services to address those needs. School mental health programming include an array of services that address prevention, early intervention and treatment needs of students to facilitate well being and positive healthy youth development. The provision of mental health services involve partnerships between schools and community health/mental health organizations guided by families and youth and is culturally and linguistically competent. Services are integrated into existing school programs, services and strategies focusing on the student population as a whole. Mental health professionals provide additional student supports in schools. Student mental health is directly connected to positive academic outcomes and student achievement. Addressing the mental health needs of students enhances factors that increase a student’s ability to succeed in and reduces factors that interfere with a student’s ability to succeed in school. School mental health strategies have been shown to improve academic outcomes, reduce disciple referrals, increase graduation rates, increase student attendance and facilitate a positive school climate. Weist, M. D. & Paternite, C. E. (2006). Building an interconnected policy-training-practice-research agenda to advance school mental health. Education and Treatment of Children, 29, 173-196. Cunningham, D. (2011). The Role of Mental Health in Schools. Presentation at the 2011 OSDFS National Conference: Washington, DC. Provides information, organized into three sections—evidence-base programs, expert/consensus statements, and adherence to standards—about best practices that address specific objectives of the National Strategy for Suicide Prevention. The website also contains a searchable Best Practices Registry (BPR) database as well as news and events, training institute, and reference library. 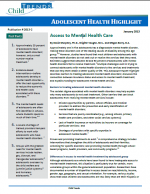 Provides an overview of health care reform and the implications for school mental health. Highlights important changes to health care under the Affordable Care Act and its potential impact on mental health services for children and families. Cunningham, J., Grimm, L. O., Brandt, N. E., Lever, N., & Stephan, S.
Considers school policies that try to assist teachers in dealing with the variety of psychosocial and health problems that interfere with learning and performance. Cautions against fragmented supports for students and reviews the benefits of a "whole child" approach for improved outcomes. Adelman, H.S. & Taylor, L.
Provides tool kits for schools and educators on tips for responding to a school crisis and administering psychological first aid. The resource also provides additional resources on how to appropriately respond to trauma, bullying and other school safety related issues. Presents a select group of strategies based on the best available evidence to help communities and States sharpen their focus on prevention activities with the greatest potential to prevent suicide. These strategies include: strengthening economic supports; strengthening access and delivery of suicide care; creating protective environments; promoting connectedness; teaching coping and problem-solving skills; identifying and supporting people at risk; and lessening harms and preventing future risk. Describes barriers to treatment of adolescent mental health disorders; discusses the connection between insurance status and access to mental health treatment; and explains funding for adolescent mental health services. 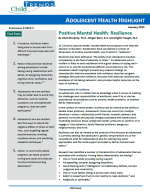 Presents key research findings on characteristics that are associated with resilience; describes program strategies that promote resilience; discusses links between resilience and avoidance of risk-taking behaviors; and provides helpful resources on the topic of resilience. Are the Children Well? A Model and Recommendations for Promoting the Mental Wellness of the Nation's Young People. 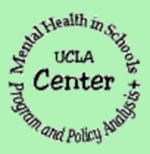 The presence of school-based health centers with mental health services has been shown to significantly decrease rates of depression and suicidal ideation in students at those schools.